"Seasoned with mustard, Worcestershire and chili sauce, these burgers are wrapped in bacon and broiled for a juicy, flavorful lunch or dinner treat." In large bowl, mix together all ingredients, except bacon and buns, until well combined. Shape into 6 patties. 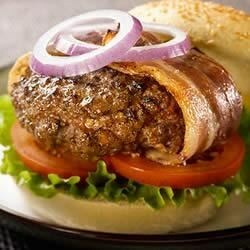 Wrap bacon slice around each patty, overlapping at top. Place on broiler pan. Broil about 6 minutes per side until meat is cooked to desired doneness and bacon crisps. Serve immediately on toasted buns. Garnish as desired. In keeping with good allergy practices, we remind you to be aware of allergens and to check labels on any packaged goods used. This recipe has been tested using Kellogg's® products. Results with other products may vary. I was intrigued with the Rice Krispies in this recipe, and decided to give it a try. I am glad I did. The burgers were juicy, and had a great taste. Can you say YUMMY! !Great recipe!Making it again!